It all started in June of 1754. The villagers of Windham were awakened in the middle of the night by terrible sounds coming from up the road. The settlers prepared for battle, fearing it was an Indian attack. When morning came the villagers grabbed their guns and marched towards the direction of the noise. When they arrived at the nearby pond the villagers were shocked to find the bodies of hundreds of dead bullfrogs. Those frogs that were still alive were heading towards the Willimantic River. 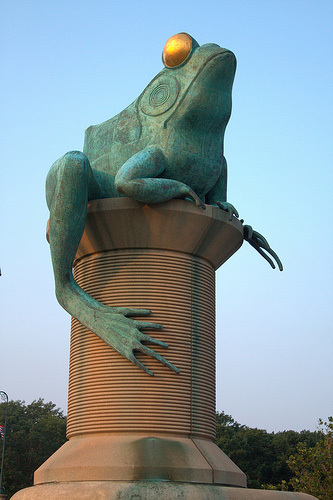 The reason for the Bullfrog Battle was unclear. Some say there had been a drought, and the Bullfrogs were fighting for territory. Others say it was not a particularly dry summer, and there had been no drought. Another version is that the Miller had opened the dam's gate leaving the water level quite low. The pond was named Frog Pond from then on. The villagers took the frogs on as their mascot. To this day, you can see frogs all over Windham. Many towns in Connecticut have nicknames according to what their factories produced, or what the town was or is famous for. Willimantic is the "Thread City" because of the American Thread Company, which was the largest employer in town.